Add pasta in a boiling water. cook till aldente. Reserve 1/2 Cup of water,drain the water, run cold water over to stop cooking. Heat oil, do the seasoning . Add Onions fry till translucent. Add ginger paste, all the masala powder, cover to cook for few minutes. Mix in tomatoes ,cook till juice wilts from tomatoes. Add the reserved pasta water if necessary. 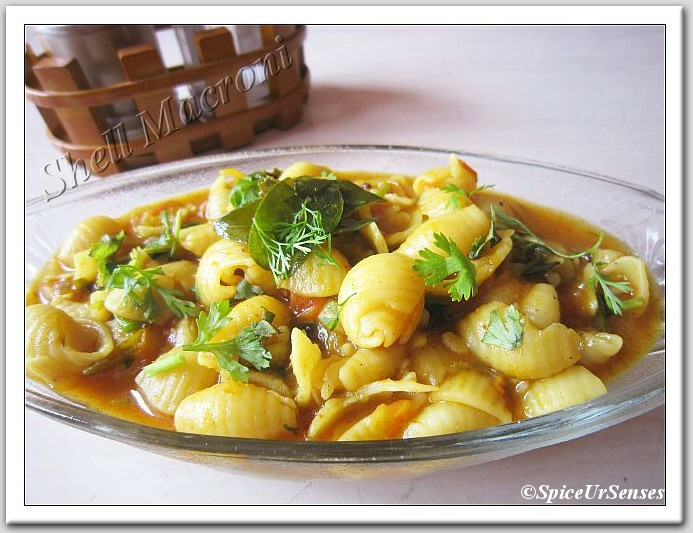 Garnish with fresh coriander leaves and serve with cheese Sprinkle. It looks really yummy, Rumana..Great pic! Wow very inviting and delectable pasta dish..
Love this shell shaped macaroni...luks delicious. Great looking,catchy and tempting, absolutely inviting. That looks delicious! Pasta would definitely work with a curry sauce. Love the Indian flavours in the macroni. I bet that tastes really good!